It’s been the kind of winter that will empty our cupboard. At the end of last winter, we still had green beans and corn in the freezer, and lots of leftover salsa. This year, it looks like we will be using it all. In early March, when it’s still too cold to hope for anything new from outdoors, the cook has to have a little fun. Remember those purple sweet potatoes I’ve gone on and on about? 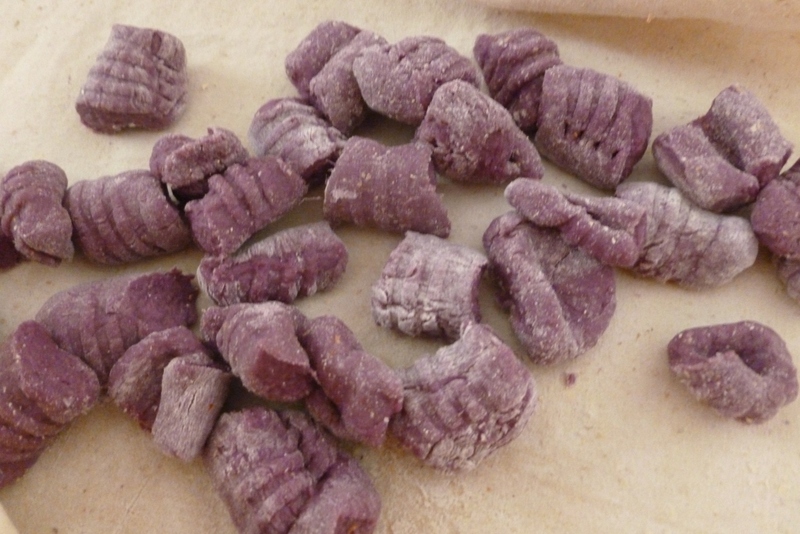 It’s time to make Purple Gnocchi. Bake a sweet potato (a purple one, if possible). Cool it off and remove the skin. Mash the flesh up until it’s nicely smooth. Add a little salt if desired. Now, sift white flour over the mashed sweet potato. Sift some on, stir it in, then sift some more. Go slow, watch your dough. When the dough gets smooth enough to begin to hold together and roll, that’s enough. Roll some nice long snakes of dough, maybe 1 inch thick on a floured surface (I love a pastry cloth for this). Cut the snakes into little bites. Then roll then gently over the tines of a fork. (Sorry I don’t have photos of this, but my hands were messy) Kids love to do this, and it’s hard to mess up, so let them at it. Keep the rolled gnocchi laid in one layer – if they get piled up they may start sticking together, which is a real mess. Drop ten to fifteen gnocchi into a pot water at a rolling boil. Stir quickly to make sure they’re not sticking to the bottom, then wait. It’s like magic. They float to the top when they’re done. Scoop them off with a slotted spoon and lay them on a plate, maybe in a warm oven, to keep while the others cook. While you cook the gnocchi, whip up a batch of nut pesto. Green pesto is great on these too, and the colors are tremendous, but nut pesto is easy and delicious when you’re out of basil. 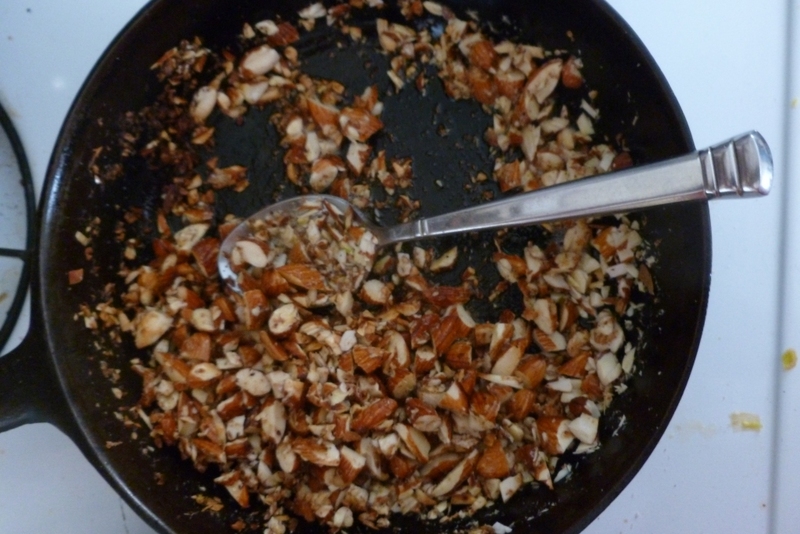 Combine chopped nuts (I like almonds best) and garlic in a skillet with some butter or olive oil. Toast until fragrant, not black. Pour that sizzling stuff over the gnocchi and enjoy. To be honest, our children didn’t enjoy eating the gnocchi as much as they enjoyed making it, which was OK, because it meant there was more for the grown-ups. Yum. Traditionally, gnocchi is made with white potatoes – same plan, but probably with the addition of an egg to help things hold together. This recipe should work just fine with regular sweet potatoes, too. Variation is a beautiful thing. 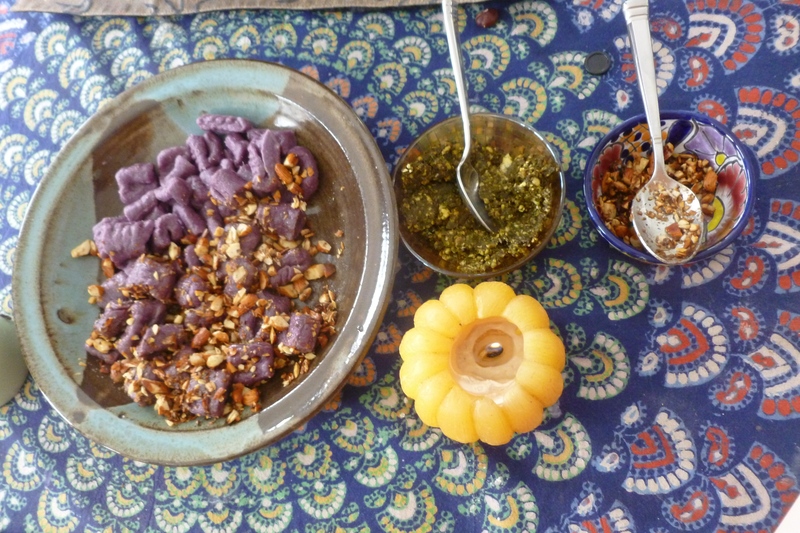 This entry was posted in coree's posts, the farmwives kitchen and tagged food, gnocchi, pesto, purple food, purple sweet potato, recipe, recipes, sweet potato, winter by Coree. Bookmark the permalink. Sounds pretty simple, but I just used all of my sweet potatoes yesterday in a casserole and quick bread (recipe to come later this week). However, since I live in suburbia, it is not a big deal to run to the store to buy more. The CSA seems to have run out of sweets for the year.